It's been a month and a half since our first Getting Started Guide for the game, and so much has changed since then! The old version is now confusingly wrong, as it refers to tons of stuff that either is no longer in the game or which you don't encounter until after you complete the intro mission, etc. The intro mission itself is meant to be self-explanatory, but it's also meant to be more of a linear early-game experience than a hand-holding tutorial. So what we thought we'd do is make a little strategy guide of sorts to give you a hand if some aspect of the intro mission requires extra explanation. Enjoy! This is Environ, a world that's been shattered by an unknown cataclysm. We've tried the make the game as self-explanatory as possible, but there's a lot here. When the game loads, the first thing to do is update to the latest beta if there are any updates available. There almost always are! This is a pretty quick process, and it gets you the absolute latest and greatest version of the game. Once you've got the game up to date, Click 'Play' to get started, choose a name for your world, then press OK. Now it's time to pick your character. 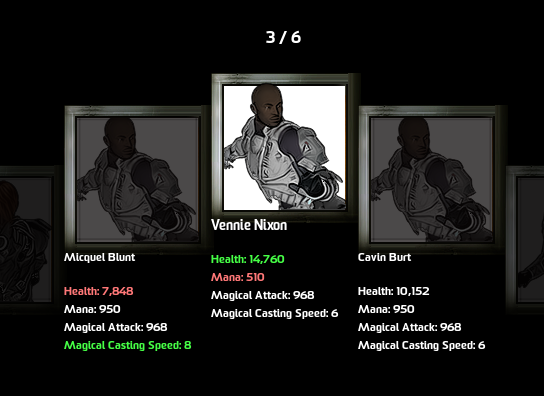 Each character has a list of randomly chosen stats below them. The meaning of each isn't crucial at this point, but it's good to know that green stats are good, red ones are below average, and white are average. Once you pick your character, you'll start the game in an ice age tundra. You will see your “Action Bar” in the bottom left corner of your screen (it's empty right now, but that will change soon). In the top left corner is the mini map of the current “chunk” that you are in. On the minimap are dots, the colors of which have specific meanings. A blinking red dot would be a boss enemy, an orange dot represents loot of some sort, etc. You will learn the other colors as you progress in the game. Finally, in the bottom right is the Dungeon Map. At the moment, this is showing you all of the surface chunks in the region. When you are in a cave or a building, it will show you the relationships between the chunks (rooms or caverns) in those areas as well. 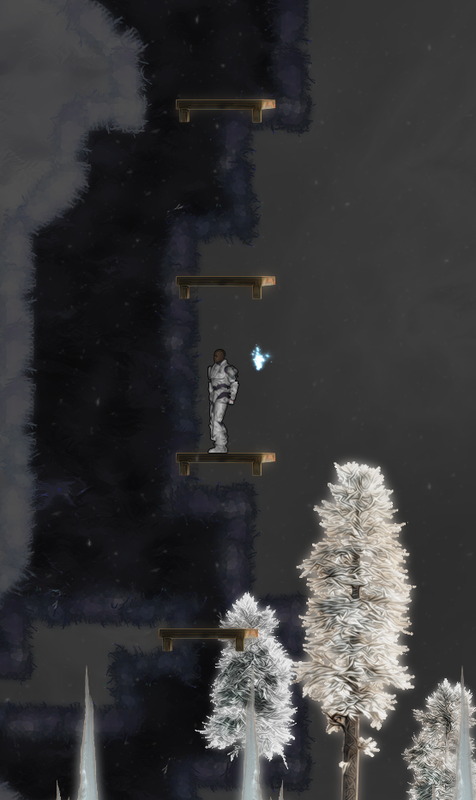 Move to the right to get started, and use the jump key to get over any small obstacles in the terrain. As you do, you will see a coffer with a Fire Touch spellgem in it. Grabbing this spellgem will allow you to case the Fire Touch spell, which is a close-range attack that doesn't do a lot of damage, but costs no mana. Keep walking off the right-hand side of the screen to continue to the next area. 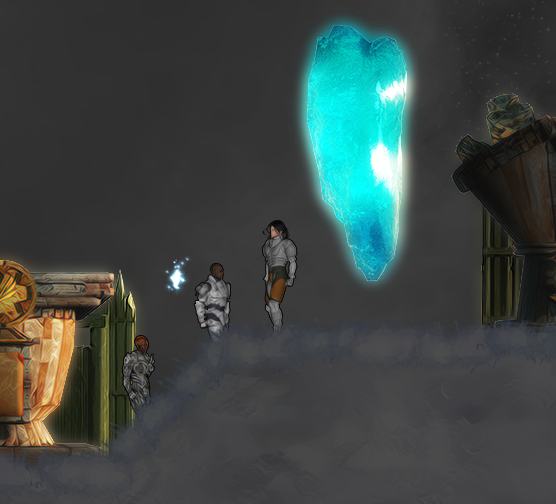 You may have noticed that there was more loot up high in the first area. You can't get this now, but when you later get wood platforms, feel free to come back and grab it if you wish (though doing so is not required, and you can get the same item further into the intro mission anyhow). 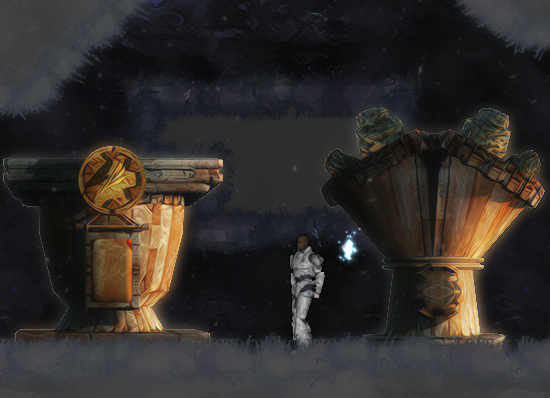 In the second chunk you will find a tombstone; there are several of them throughout the intro mission, and they will offer clues and hints to get you through this part of the game and beyond. It's a good idea to read them! If the first one isn't clear enough, use the Fire Touch spell on the crates to destroy them and thus proceed beyond. The next coffer has the wood platforms, which you will need to get past the next area. But, before we go on, lets grab one other thing from this chunk. Look on your minimap: see the orange dot way up high? You'll want that. This might be a good time to talk about your action bar. 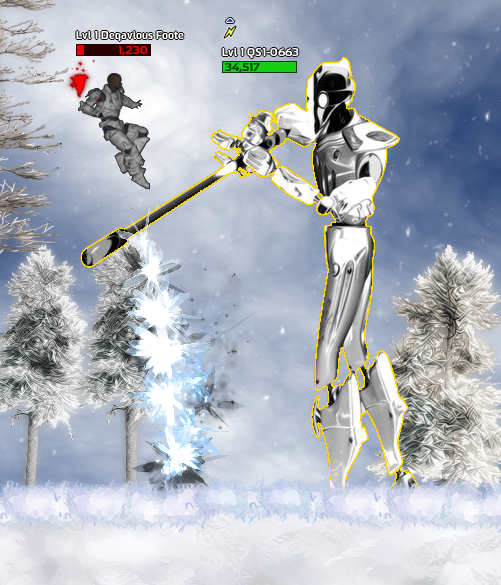 As you have probably figured out, the fist action in your action bar is triggered by the left mouse button. Additionally, the second slot in your bar is triggered by the right mouse button. The third slot by the middle mouse button. If you have additional mouse buttons, this pattern will continue. You can also trigger any action in your bar by right-clicking on its slot or by pressing the corresponding number on your keyboard. All of your spells and items that are not in your action bar are stored in your inventory, which you can access by pressing “I”. 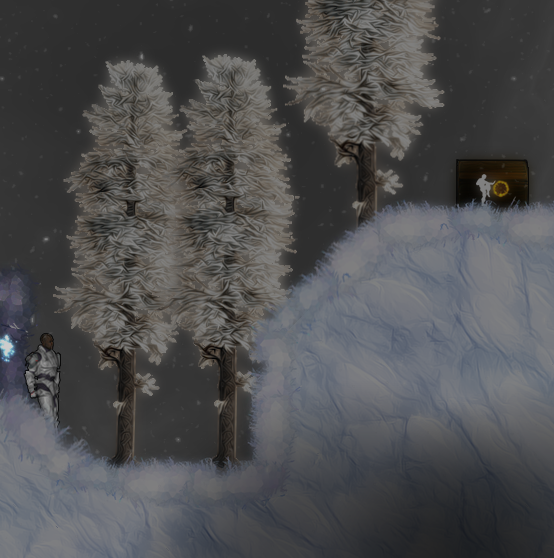 At any time, you can click and drag the items and spells in your inventory around to wherever you want them. Assuming you've been following this guide, your platforms should be in the second slot of your action bar. If so then, simply right click on the screen a few times above you, jump up (add a few more if you need to), then get the warp potions up in the rock crevice. These will save you time later, so you can immediately warp back to your last location if you die. The next chunk features a pool of water. Be careful! The water may look harmless, but the cataclysm has actually made it highly acidic; staying in the water will eventually kill you. 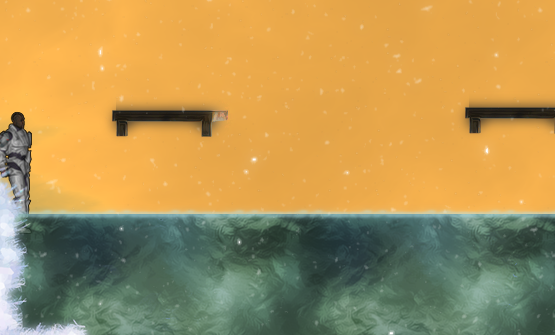 You will need to deploy your wood platforms over the water, and then jump on them, to get across. The next area starts with a sheer cliff: again, deploying platforms is the way to get past. On the other side of this cliff rests a building. You aren't required to go into all buildings, but they can be a good source of supplies to help get you further in the game. This particular building does have a spellgem that you will need to advance, so lets go get it! Press the action button 'E' while standing by the building's door to go inside (you will see a note telling you that as well). Once inside, you will see two ladders. Press down on the ladders to drop through them (yeah, it's dark -- we'll fix that shortly). At the bottom you will find a coffer with ten Emit Light scrolls. Grab these, and then activate one of them by right-clicking on the new icon in your action bar. Now that you can see well, look for the vent right above the coffer, in between the two ladders. Jump up to that vent and press the action button again. You can place a wood platform under the vent if you have trouble pressing the action button while jumping. 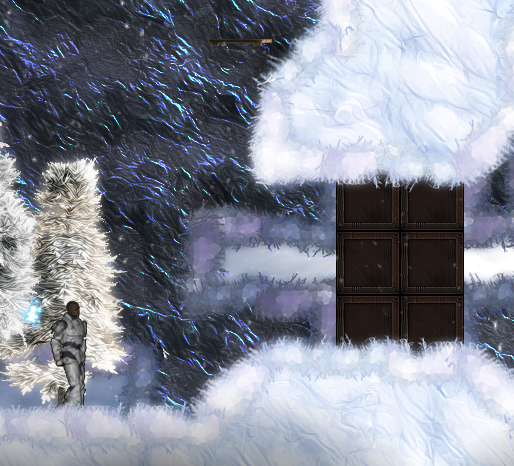 The new room on the other side of the vent is small and simple, but contains a powerful spellgem called Ball Lightning. Ball Lightning is your first ranged offensive spell, and it can do a lot of damage, which we'll see in action shortly. Head back through the vent to the other room you were in, jump back up the ladders, and head through the second white door from the left. This will lead you to a room with a platform near the top with two doors. Take the left door. This is a “stash” room, as indicated on the dungeon map with the color yellow. Stash rooms have all kinds of stuff that will be helpful as you venture out. This particular one has three coffers. The most important things you will need here are the potions. The green potions will restore your health, the blue ones will restore your mana. 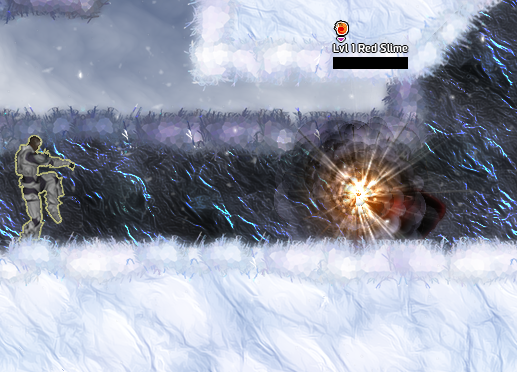 There is also a Storm Dash spellgem, which makes it much faster to traverse wide open areas. Once you have these, there's nothing more you absolutely need inside the building; but if you want to explore the rest of it, feel free, as there are other goodies lying around. Once you're done in the building, it's time to use the warp potions you found a couple chunks back. Rather than backtracking all the way through the building on foot, let's just warp straight outside! Press the period key until you see the region map instead of the dungeon map. Click on the long green rectangle, which represents the surface dungeon. You will then be looking at the dungeon map of the surface instead of the building. Click on the rightmost node in this map that doesn't have a black line through it. This will warp you back out to the grounds outside the building (or further, if you passed the building before doubling back to go inside it). You can use these warp potions to warp to places you've already been -- there's never a need to backtrack unless you run out of warp potions! Back Outside; aka Our First Enemy! Now that you are back outside of the building, move on to the next area. As you can tell from the tombstones, the red slime up ahead can be pretty dangerous. But don't worry, you have the tools to take him out. As soon as you get on the same level as the slime, which looks like a big, red blob, fire your Ball Lightning at it a few times. Don't get too close, because if you do, it will attack you. Once it's dispatched, move through to the next area. 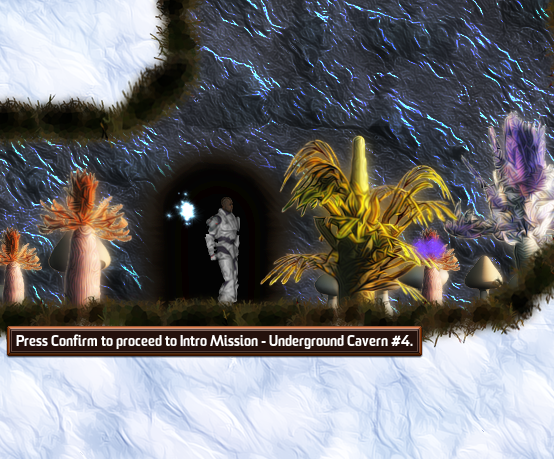 This next area is the beginning of a cave. There's quite a bit in these “surface tunnels,” but for now, head towards the bottom left and go in the door you see in the wall. This will take us deeper into the cave, towards some raw gems so we can learn how to craft more spellgems. You'll need to use something different to get past the next slime, which happens to be resistant to Ball Lightning and Fire Touch. You don't need to kill minor monsters in this game, but doing so means they won't be hitting you. Once you have gone down to that platform, head a bit more to the right and you will see another door -- behind which is the cavern containing the raw gems. For the cavern with the gem veins, head to the left, drop straight down, and head left across the water, using platforms to get across. On the far side you'll find two easy-to-harvest raw jade gem veins. You can use Fire Touch on this to break it down, and you will get one raw jade and two jade gem dusts from each one. There is a third gem vein on the far right side of the cavern, but that one is much more of a battle to collect. Now that you've got the gem, head back two rooms (to the beginning of the cave), preferably by warping. There are convenient coffers of warp scrolls in the gem vein caverns in case you are running low. Once you're back at the surface tunnels, head to the top of the chunk and you will see the crafting benches as shown above. Press confirm while standing in front of the spellgem workbench. 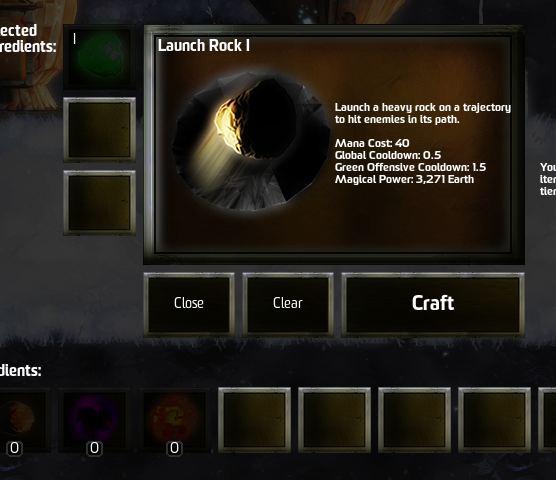 This will bring you to the spellgem crafting interface. Click on the raw jade to bring up the info on a spell called “Launch Rock”, this spell will help us against that next slime. Click craft, and the spell will now be in your action bar or inventory. If you don't see it, press “I” to view your inventory and you will find it there. There is another color of gem in the caves you can get if you wish, but it's not necessary, and it does require you to kill your first set of minibosses in order to get them. In the chunk where you crafted the spellgem, head to the bottom right there is a red and yellow slime blocking your way. Once again, don't get too close -- and this one has a twist, in that it's resistant to your Ball Lightning. You'll have to use Throw Rock to get past. With the second slime dead, finally you enter the last portion of the intro mission. After that you will move on to the full game... only there's a giant skelebot miniboss standing in your way! You can choose to fight him or just slip quietly past. Whether or not you take him out is up to you, but, if you do, you will gain valuable EXP for your civilization, advancing you towards more and more powerful spells. If you don't, you will still have numerous other opportunities to gain the EXP you need in the main game itself. 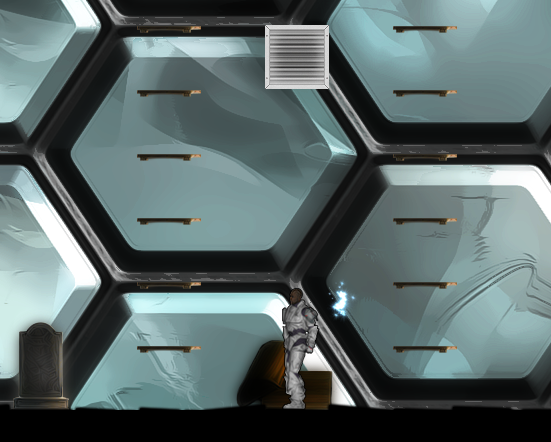 Most EXP is gained by fighting bosses, though some is found by collecting EXP containers in large rooms in buildings. If you want to kill the boss, use spells like Ball Lightning and Throw Rock and try to hit him without falling down where he can physically attack you. You will still have to dodge the fireballs he's throwing at you even if you stay up high, though. If you prefer to skip the boss for now, you can use platforms and get above him, and simply walk to the other side of the chunk to leave. Either way, this ends the intro to the game. Going Out Into The Full World; or What Now? After you leave the intro, you will be put into your first settlement. This settlement will likely be your “home base” for quite some time. In here are guardian stones that will fully heal you and restore your mana, and restore you up to four warp potions if you are running low. You can see other people living here as well, who you will optionally be able to play as once you get some“Transfer Glyph” spell scrolls. From any settlement you will also be able to run a lot of the citybuilding and strategic-type features that will be unlocked as your civilization level increases. A lot of the "macrogame" features don't show up until civilization level 3, so you have some time to just explore in the side view and get used to that. Leaving the right-hand side of the settlement chunk will take you to the world map, an overhead view. On the world map there is a numerical value to each tile -- this "region level" denotes the level of the enemies and bosses in each area, as well as the general quality of the rewards you'll find. Bosses and the EXP containers will grant more EXP the higher the region relative to your current level. If you feel the game is too easy, you can go to regions that are above your current level. Otherwise feel free to play in areas that are at or even below your level. You can also tune the action or strategic difficulty of the game at any Difficulty Shrine. You started out the intro mission next to such a shrine, and there is also one located in each settlement. Any time you die, your new character will appear by one of those shrines. Besides the level of each region, you should also note some of the icons on the map. Many of them represent Rare Commodity Towers, which have multiple bosses guarding a rare crafting resource at the top. 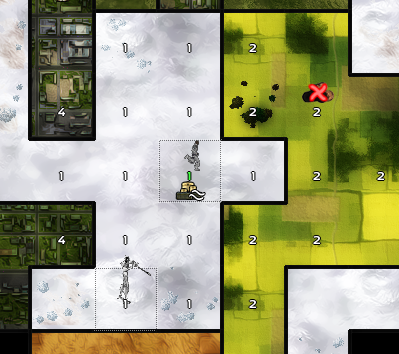 From time to time there will also be groups of rampaging monsters on your map. They will demand resources from your settlement, but you can fight them (and gain EXP for doing so) if you don't want to pay. You can right-click on any region for more information about the various icons. 1. Explore various regions to gain new crafting materials to craft more powerful and exciting spellgems and spell scrolls. The Reference Info button on the in-game menu (press escape to see) has detailed info on things you can craft, what materials are required, and even where you can typically find those materials. 2. Try to gain as much EXP as possible by defeating bosses and exploring large buildings. Getting better spells and equipment will really help you in this endeavor, hence the importance of exploring for better crafting materials. Often you can accomplish both of these goals at once, as there tends to be minibosses guarding most of the more valuable crafting supplies. 3. As your civilization levels up from all the EXP you are bringing in, you'll unlock the "strategic overlay" and the "settlement management" interfaces. These let you build homes and other buildings for your NPCs, it lets you order around your NPCs to explore the world map, and it even lets you rescue other settlers that you find in the wilderness, adding to your population. Improve the morale of your settlers to have them produce resources at peak efficiency. There are a lot of in-game tips (and tooltips) explaining all of this once you gain access to it. Bear in mind all of this is optional. 4. Try to find the lieutenants that are oppressing the land, and then ultimately the overlord that they serve. You probably won't have an overlord move into your world until you reach civilization level 10 or so. And you'll likely need to be around level 20ish before you can take him out. The overlord keeps and evil outposts of the lieutenants provide special and interesting challenges. 5. Explore the world for its own sake! Every time your civilization level increases, the world gets larger. As your civilization level goes up you'll also start finding objects, enemies, crafting materials, and even whole region types that you've never seen before. There's a lot to discover, and as the game continues to be developed further there will be more and more to find in your existing worlds. There's really a whole lot more in the game, but, you should go ahead and discover it for yourself. Have fun!